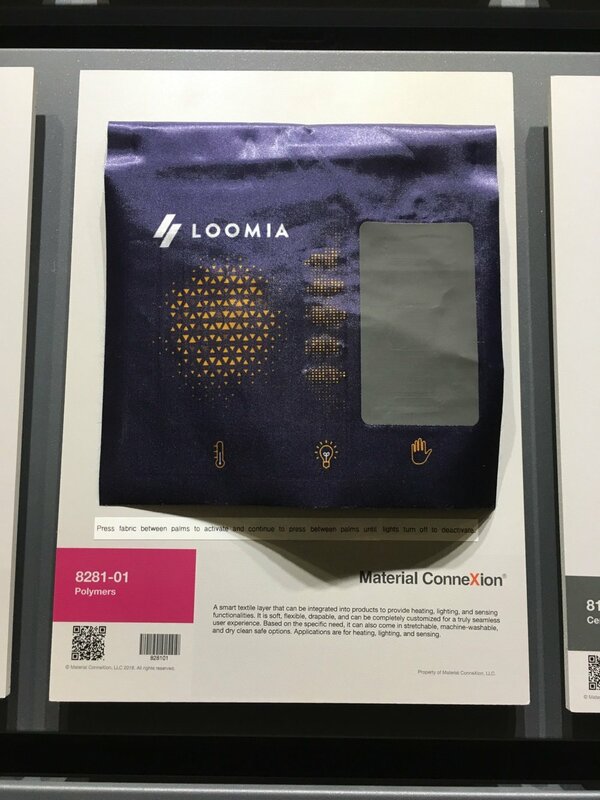 We are excited to share that the LOOMIA Electronic Layer (LEL) playmat is now part of the Material ConneXion (MCX) library. MCX is home to the world’s largest library of advanced and sustainable materials, and one of the few to provide full transparency about the chemistry behind those materials. With over 8000 library samples, MCX employs a rigorous review process to ensure that all materials in the library provide a truly sustainable and competitive edge to designers around the world. We are honored to be new inductees. The LEL Playmat is slotted into the the “smart textiles” topic as part of the “polymer” category, as it’s a combination of various metals and polyester. What is included within the LEL Playmat? The playmat showcases the three primary applications of our patented technology: touch sensing for flexible user interfaces, flat custom lighting for safety, and heating for comfort. LOOMIA has developed core IP that makes samples like the LEL playmat possible. The capacitive touch portion (at left), known as “cap touch”, activates the lighting and heating functionalities. “At first touch, as visualized above, heating and lighting areas are activated. Heating will take a few seconds to reach its highest temperature. What is LOOMIA patented tech? We create drapable, flexible soft circuits that can create anything a normal printed circuit board (PCB) can. Why use this? Our circuits can go places that normal PCBs cannot, enhancing the function of fabrics in clothing, furniture, industrial wear, and beyond. Depending on each company’s needs, we can apply our technology to many different scenarios. For instance, cap touch can serve as a fabric trackpad of sorts, giving users freedom to move at will and control functions of a smart garment without needing to interact with a hard user interface. With mere touch, a user can adjust its heating / lighting functions! Plus…no wire-snapping here! The circuitry layer we’ve developed is soft, foldable, and thin with no wires, making it very appropriate for textiles. Being only 10 mils thick, it is one of the slimmest heat delivery form factors in the market. Based on the specific need, machine-washable and eco-friendly dry clean safe options are also available. Check out this video with a great explanation of the LEL’s innovative properties from Material ConneXion’s Senior Materials Scientist, Gayatri Keskar. At LOOMIA, we care deeply about creating a seamless user experience for our customers, so no standard off-the-shelf solutions are available. If you are interested in working together, please get in touch here and we will be happy to develop a custom solution catered to your company’s specific needs. Of course, you can also visit our display in the New Arrivals section at the Material ConneXion library in NYC to see the material for yourself (pictured at left). Learn more about visiting here. Thank you for including us, MCX!